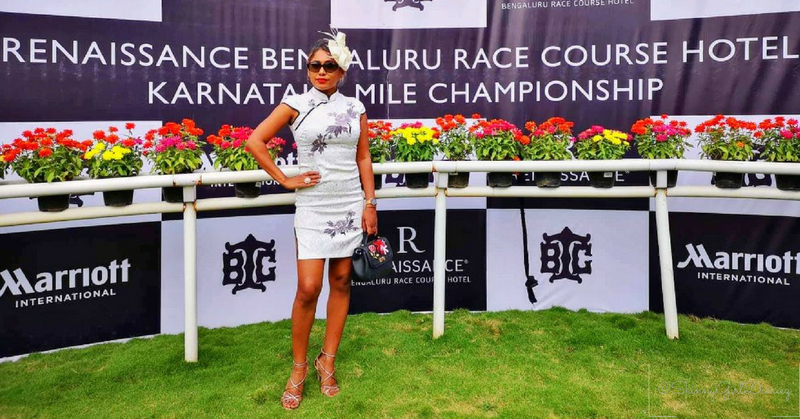 Last weekend I got to attend The Renaissance Bengaluru Race Course Hotel – Karnataka Championship Cup 2018. Horse racing at the Bangalore Turf Club! I have attending quite a few over the years and still beyond excited each time I attend the event. There are countless number of images and ‘how to dress’ or ‘what to wear’ at the derby. So getting an inspo out of the internet is your best bet. Dresses to fancy tops and skirts paired with a fascinator or a hat is brilliant and completes the look. It was a exclusive invite event, more so a corporate guest-list and invites only. I decided to go for a more simple yet elegant look. A black & white mandarine styled dress, with themed with an elegant fascinator. I kept the heels basic with a gold shade to add some bling. Less is always more they say. And it never fails. My accessories were minimal as the fascinator did all the talking for me. I felt like royalty just wearing it. Rule to remember is what ever you wear. Stay confident, as it shows when you pose or talk to others. I hope you liked my out fit of the day at the races. I had a wonderful time as you can see, and look forward to many more. Thanks a lot The Renaissance Hotel, Bengaluru for the exclusive invite. Until next time. Have a great week ahead!